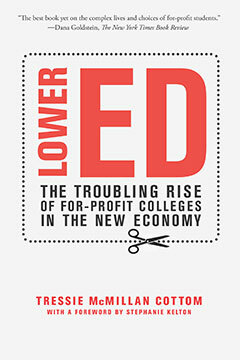 Lower Ed is quickly becoming the definitive book on the fastest-growing sector of higher education at the turn of the twenty-first century: for-profit colleges. With sharp insight and deliberate acumen, Tressie McMillan Cottom—a sociologist who was once a recruiter at two for-profit colleges—expertly parses the fraught dynamics of this big-money industry. An interview with Tressie McMillan Cottom on NPR's blog, "nprEd." Tressie McMillan Cottom discusses for-profit colleges and Lower Ed in an interview with NPR's "Marketplace." Author Tressie McMillan Cottom appears for a radio interview on WNYC's "The Leonard Lopate Show."